The season here in NJ is rapidly changing Time for my favorite method of one pot cooking . Clay pot cooking is absolutely the easiest most delicious method of roasting indoors. It warms my heart, soul and kitchen. Once the pot is filled with all the goodness of the season, the aromas coming out of your kitchen will intoxicate you and yours. JUST TRY IT. ITS VERY SIMPLE. 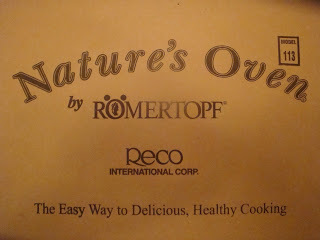 The pot I use is a Romentopf, you can look at the site online. There are many varieties of pots and different sizes. For this recipe I used my smaller pot. It worked perfectly. This was a two pound boneless turkey breast with veggies and total cooking time was one hour at 400 degrees. 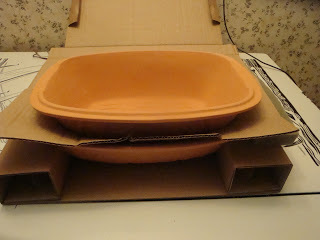 then add rest of veggies building a bed for the breast to be placed on. Put the turkey on top of the veggies, then add the broth. To top of veggies and up to the base of the turkey breast. Cook about 50 minutes covered, take off last 10 minutes to brown, no need to baste but after you take the top off brush with the broth/gravy that should be bubbling and fragrant after 50 minutes. Add some chopped parsley optional. Be careful to wear mitts on your hands and open top away from your face. Remove the turkey breast, and serve with the veggies and amazing gravy you have just created.